Mahindra Quanto, the much anticipated mini-SUV, was launched last week. The campaign aims to connect with young professionals with the ‘Make Weekdays Feel like Weekends’ premise. As is the case with Mahindra & Mahindra’s portfolio of products and services, this one also has a 360 degree web presence at launch. The content across platforms introduces the Quanto via videos, Feature & USP call-outs, E-brochures, exterior and interior views and galleries. The website is compact (perfect product connect, if you will!) and carries all the information that a user would need to know. I also like the transitions that kick in when you click on a specific tab to know more. This one has a different look and feel from what you have come to expect from auto websites. Brand presence across Social Media platforms is an extension of this content. The Youtube Brand Page doesn’t just feature predictable TVCs. There are specially created Quanto demo videos that detail features much like what you will get at the showrooms. Facebook and Twitter Pages call out the latest developments in the few posts that they have till date. The Brand is also executing high impact launch rich media across few publishers. 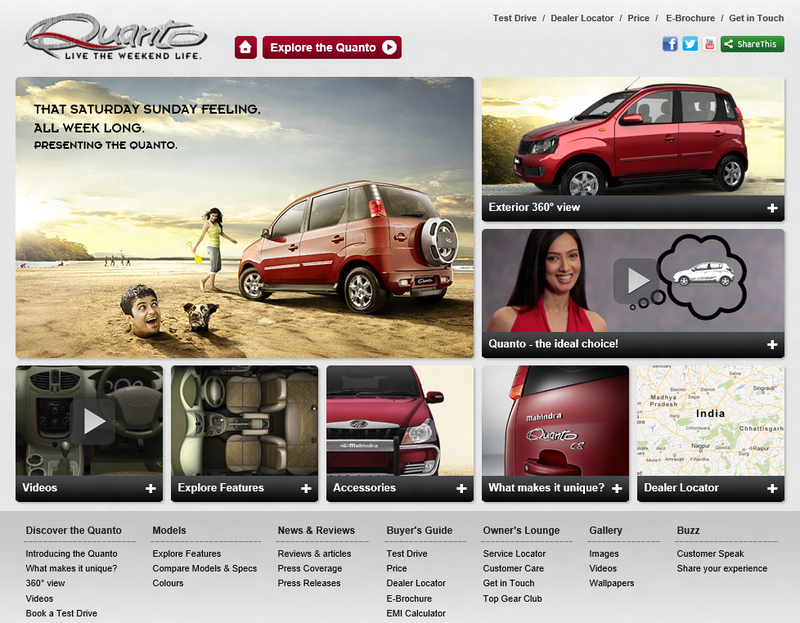 Going by Mahindra & Mahindra’s penchant for creating interesting online campaigns, there should be more to come. This car looks fascinating and its so inexpensive.This car is going to steal the magic and craze of other cars from Indian market.I like it looks and I don't have any doubt over Mahindra'a engine's power and efficiency.